1). God the Father is the redemptive Father of the nation of Israel. He redeemed His people. Imagery such as He carrying Israel as a helpless son was found in the writings of Moses and the Prophets. 2). God the Father is also depicted in eternity as the One True and living God, Yahweh. Certain passage indicate that the Person of the Father had certain conversations with another figure called "The Son". Although the outline is very faint in the Old Testament, we nonetheless get a glimpse of the Pre-incarnate Son of God who in some fashion has shared in a pre-existent, eternal relationship with the Heavenly Father. It will take the New Testament revelation of the Gospels, Acts, Epistles and Revelation to bring out the details of the nature of the relationship carried on between the Father and the Son. Today we want to walk our way through the New Testament material. It must be underscored that in comparison to the Old Testament passages on the Father, the New Testament mentions the Person of the Father over 100 times. When the Person of the Son appeared in His incarnation as Jesus of Nazareth, references to the Father, especially in personal terms, expanded many times over. "If the New Testament affirms monotheism, however, it is also the Christian claim that the Old Testament already anticipates some sort of plurality when three distinct actors appear on the stage in Israel's history, sometimes even in the same scene, each identified as God. On the basis of the new thing that God had accomplished in Jesus Christ, the early Christians were directed by Jesus (especially in his postresurrection instruction reported in Luke 24) to reread the Old Testament texts with Him at their center." With these thoughts in mind, I will simply list key New Testament passages and bear out a scant few remarks, since the material is overwhelmingly vast. Matthew 3:16-17. The Father is bearing witness from heaven about the Eternal Son in human flesh. We also see the Person of the Holy Spirit descending down as a manifested dove. All three Persons of the Trinity make their appearance in this text. Jesus does not become the Son at the moment of His baptism. Rather, the Father is bearing witness of an eternal identity that has been enjoyed by the Person incarnated as the man, Jesus of Nazareth. In short, Jesus is the son of Mary with respect to His human nature and the Son of God with reference to His Divine nature. Matthew 6:1-37. In the midst of Jesus "Sermon on the Mount" we find ten references to the Person of the Father. He is depicted as the Heavenly, Kingly and Merciful Father to His people. Mark 8:38. Jesus refers to how He will appear a second time in the glory of His Father and the heavenly angels. Luke 10:22. We read "All things have been handed over to Me by My Father, and no one knows who the Son is except the Father, and who the Father is except the Son, and anyone to whom the Son wills to reveal Him.” Jesus makes knowing the Father central to what is entailed in Personal saving faith in Him. John 6:46, 17:5. These two passages respectively are used by Jesus to show how with respect to the Father, He shares in the same Divine nature as He. The Oneness of the Father and the Son in being is asserted by Jesus, and thus constitutes the cornerstone for His claims to Deity. The later verse speaks of the meaning of eternal life or salvation: to know the truly and living God and Jesus Christ whom He sent. The Father is undoubtedly the One who sent Jesus. Both are distinct Person, yet One God - and thus the Son is as much the source of salvation as the Father. The Book of Acts. We find no less than five references by name to the Person of the Father. The Father is credited with having sent the promised Holy Spirit in, by and through the Son. He is the God who raised Jesus from the dead. The Father has authority in the realm of decreeing times, seasons and regulating all history, including the timing of the cross, the appearance of Christ in His first coming and what will be the second coming of Christ. The theological development of the Deity and worship of Jesus is predicated upon the Jewish Old Testament conception of the Person of the Father, with Whom He shares in one undivided Divine nature. 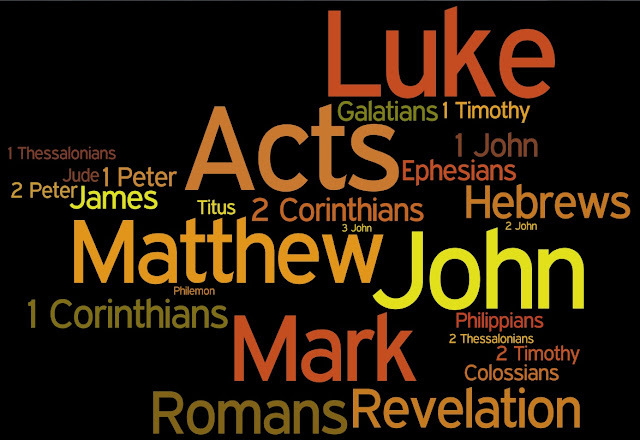 The New Testament letters. We could detail the numerous references to the Father found in Paul's letters and the General Epistles. We can note how often Paul makes reference to the Father, along with the Son, as the common source of grace, mercy and peace. This common greeting at the beginning of most of his letters tells us that the early Christian movement, from its inception, saw the Father and the Son as One common source, further providing an important bridge to what would be a fully developed doctrine of the Trinity. The general letters (Hebrews-2 Peter) will interchange the Divine titles between the Person of the Father and the Person of the Son. It is astonishing to see the progressive revelation of scripture unfold from Old to New Testament with respect to the Father and the Son as Divine members containing true union in Deity and Deity expressed as a diversity of Persons (Father, Son and of course, the Holy Spirit). We have only sampled a small portion of the vast New Testament development of the Father. We find that in His unique relationship with Jesus, the foundation for Jesus' claims as God in human flesh is established. Both Persons are understood to have shared the One Divine nature from all eternity. The Son came to assume humanity, whilst never ceasing to be God. The Father was ever at the center of Jesus' experience of Him as man and at the same time, they ever had unbroken fellowship within the Godhead. The Father's sending of the Holy Spirit would become yet another element in the New Testament's development of the Triune understanding of God. May we ever endeavor to get to know the Father.